It’s an indication of why Iraq is not unraveling completely: In the midst of political crisis, the Iraqi parliament today actually managed to approve a new de-Baathification board. The decision on the issue had been stalled since 2009. 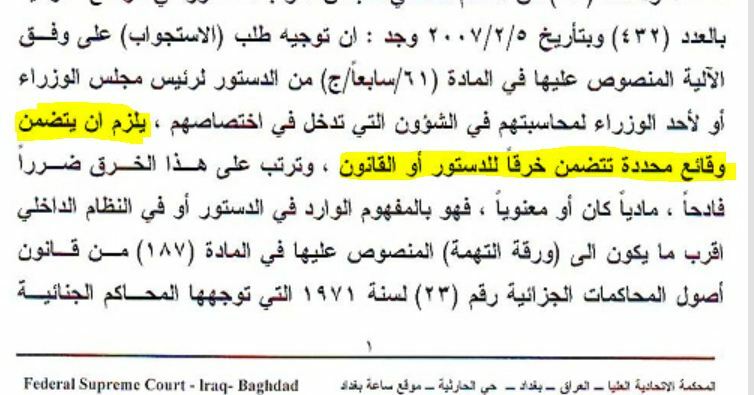 After the death of former director Ali al-Lami in May 2011 an acting official close to Prime Minister Nuri al-Maliki had taken care of the de-Baathification file. Of the seven new members who were nominated by the cabinet, two were Kurds. Those were incidentally the same Kurdish candidates that were nominated back in 2009. Today’s official parliament report mentions only one of these two and some press reports say one candidacy was withdrawn by the cabinet. Accordingly, it is quite possible only 6 members were agreed after all, which in itself is legally dubious. At any rate, two other members of the new board are close to the secular Iraqiyya party: Muzahim Darwish al-Jibburi, a former minister of state who lost his job after the cabinet was downsized last summer, and Faris Abd al-Sattar, a lawyer from Mosul who has previously worked for the Nujayfi brothers there. The remaining three commission members are connected with Shiite Islamist circles. Falah Hassan Shanshal is a Sadrist. He is considered a hardliner in de-Baathification issues and is seen as a frontrunner for the presidency of the commission. Like several other members he is a victim of the former regime in the sense that he has been previously imprisoned. Jabbar al-Muhmamadawi is also thought to have ties to the Sadrist milieu whereas Basim Muhammad al-Badri is probably linked to the Daawa. The commission of 7 members makes its decisions with a simple majority of 4. In other words, the 3 Shiite Islamists will need at least one Kurd on their side to push through their agenda. 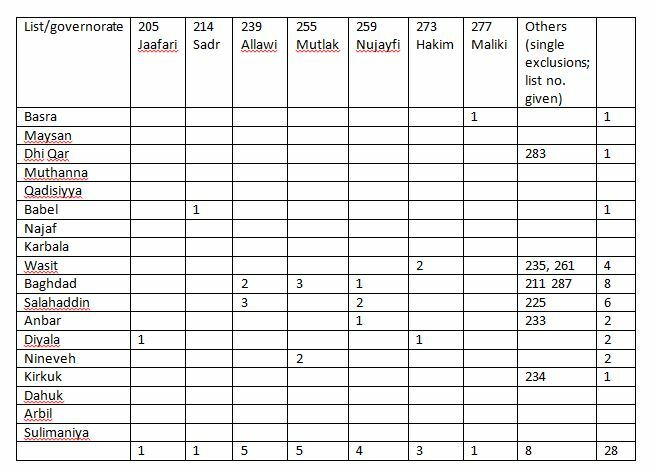 Reflecting their electoral success in 2010, Iraqiyya is better represented than in the original commission proposed by the Maliki government in 2009. At that time, Maliki had hoped to install Walid al-Hilli, a party ally, as chief of the new commission; conversely the Daawa is less prominent in the current commission line-up. Still, the fact that the board was approved by the Iraqi cabinet suggests Maliki probably considers he can live with it. It is reported that the vote went ahead in parliament without any major protests. (By way of contrast, Iraqiyya once more successfully obstructed the vote to sack the mayor of Baghdad of ISCI against the wishes of some Maliki allies and possibly the Sadrists as well.) The overall parliamentary attendance figure was given at 195. No split vote was reported nor were any massive walkouts mentioned. In other words, the de-Baathification board decision does seem to be one of those rare cases in Iraqi politics where every side is satisfied. One possible interpretation of how it succeeded is that Maliki’s Daawa is apparently taking a back seat and is leaving the role of being Baathist hardliner to the Sadrists. Today’s vote on the de-Baathification commission is interesting also as a possible harbinger of dynamics at an upcoming important vote in the Iraqi parliament: The approval of a new election commission (IHEC). Both these votes can be done legally with a simple majority. However, with respect to IHEC, Maliki is more determined to have the current board replaced since its make-up dating back to 2007 antedates his own rise to power. Alas, there was also another possible harbinger of future trends in Iraq today. After weeks with pressure on the minister of higher education to appear before parliament for questioning (and with an apparent ultimatum for him to do so this week) the Iraqi supreme court today produced a very timely ruling, as least as far as the minister’s point of view is concerned. In fact, the request for a constitutional clarification was dated as recently as 30 April, meaning that the court has been unusually effective. It should be added that the minister in question, Ali al-Adib, is from Maliki’s party. Perhaps it is its effectiveness that has led to what must be described as one of its most scandalous rulings ever, perhaps second only to the Byzantine piece of jurisprudence pertaining to the independent commissions that it produced last year. Basically, the query is about the interpretation of article 61-7-c of the constitution. That article is very simple. It enables 25 deputies to request the questioning of ministers in order to “hold them accountable for matters within their specializations”, with at least seven days between the request to the actual hearing. And that is it. But the ruling of the supreme court is far more complicated! It appears to say such requests must be accompanied by a specification of alleged constitutional and legal infractions and must define breaches and material damages in terms of criminal procedure. The court goes on to say questioning is the highest form of supervision parliament can exercise and considers it tantamount to withdrawing confidence in the minister. The problem is, absolutely none of this can be found in the constitution. Actually, the court also refers to article 58 of the parliament bylaws, but the basis for the new interpretation just isn’t there either and the legality of those bylaws – currently under review – is disputed anyway. Certainly, most cases of Iraqi ministers being questioned in the past seven years have been void of specific accusations of criminality. What we have here is a very clear case of the Iraqi supreme court producing a ruling that seems politically biased to the point where it apparently overrules the Iraqi constitution and the right of parliament to hold ministers accountable. Hopefully Iraqi politicians will use the specific problems at hand here – rather than the fantasies of the Arbil agreement, which in itself is full of unconstitutional and extra-constitutional ideas – to frame a reasonable debate about the independence of the Iraqi judiciary. They have got plenty of time to do so, because parliament is now on holiday until 14 June. The Iraqi parliamentary cycle has kicked off again following the Eid al-Adha holiday. Perhaps serving as a harbinger of legislative priorities over the coming months, a bill outlawing the Baath and parties supporting racism, terrorism, takfir and sectarian cleansing was giving its first reading. This represents an attempt at implementing the law called for under article 7 of the constitution that was not ready before the March 2010 parliamentary elections – which instead saw massive attempts at extra-judicial and vigilante de-Baathification. As usual, the bill itself is not published by parliament when it is merely on the stage of the first reading. Nonetheless, it seems likely that the bill read today was more or less similar to the one that was prepared by cabinet this summer and was leaked in some media. The parliamentary committees charged with handling the bill (security & defence, de-Baathification and legal) may have introduced minor changes along the way. The draft bill is quite short. To some extent it stays truthful to the constitutional requirements for banning the Baath and parties supporting terrorism, racism, takfir (labelling others as unbelievers) and sectarian cleansing – though it falls short of defining those ideologies it is seeking to outlaw other than the Baath. For good measure, parties that are “against the peaceful transfer of power” or against the constitution itself or the “principles of democracy” are banned as well. The bill then goes on to ban all possible forms of support and promotion of the Baath party. It further says that these measures also apply to parties promoting the other outlawed ideologies. Perhaps the most important and potentially controversial aspect of the bill is the creation of a committee that will oversee the law and hand over potential cases to the prosecution. This committee will be headed by the minister of state for parliamentary affairs, with members from the ministries of justice and human rights, the head of the consultative state assembly and two judges. As is well known, the minister of state for parliamentary affairs and the ministries of human rights and justice (which also administers the consultative state assembly) are all dominated by members of the grand Shiite alliance to which Prime Minister Nuri al-Maliki owes his second term. Of course, this all comes at a time when there is already evidence that vague accusations of Baathism are being used to settle political scores. The law then goes on to stipulate severe prison terms – mostly in the range from five to ten years – for offenders. In this section it also goes beyond the constitutionally mandated focus on political parties to also define punishment for government official discrimination on sectarian or racist grounds. There is also specific mention of the crime of forcing someone to leave his or her home for “sectarian, religious or nationalist” reasons. The biggest problem with the draft law is the combination of vague criteria (what exactly constitutes “racism”?) and the designation of a supervisory committee that inevitably will be seen as political. For example, some of the claims by the two biggest Kurdish parties to annex to the Kurdish region outlying areas where minorities of Kurds live can hardly be defined as anything other than “racism”. Similarly, the tendency of some parties to define certain governmental posts as belonging to particular ethnicities, be they Kurds or Arabs, would also seem to constitute racism. It is noteworthy that in line with the constitution, sectarianism is not outlawed as such, only sectarian cleansing. The full details of today’s debate regarding the first reading have yet to be published. It will be interesting to see which Iraqi deputy dares to be the first to demand ethnic quotas for the committee overseeing the anti-racism bill.